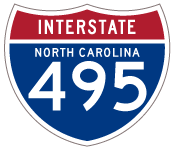 Interstate 495 was posted along the U.S. 64 freeway between I-440 in east Raleigh and I-540 near Knightdale in North Carolina. The remainder of the route east along U.S. 64 & 264 to Zebulon, and U.S. 64 from there to Interstate 95 outside Rocky Mount, was designated a Future Route pending upgrades to expand the inside and outside shoulders to interstate standards. Interstate 495’s east end was located at the full-cloverleaf interchange between U.S. 64 and Interstate 95 west of Rocky Mount. A directional T interchange between U.S. 64 & 264 (Knightdale Bypass) and Interstate 440 (Cliff Benson Beltline) was the western terminus of Interstate 495. Regional Transportation Alliance: Let’s Get Moving – Interstate 495. http://www.letsgetmoving.org/priorities/i495/ – Regional Transportation Alliance web page. “North Carolina Gets a New Interstate, with the I-495 Designation near Raleigh.” North Carolina Department of Transportation (NCDOT), news release. December 12, 2013. “North Carolina Gains Names for Two New Interstate Designations.” North Carolina Department of Transportation, news release. May 25, 2016.